Chlorella is a type of green algae. It is a simple, single-celled organism that contains chlorophyll--giving it its characteristic green color. The growing and development of chlorella as a crop is popular in Asian cultures where it is used as a food source. Chlorella is also a valuable source of nutrition for other sea and freshwater creatures such as fish and shrimp. Like other plants, chlorella requires a few things to grow and multiply: sunlight, water, carbon dioxide and nutrients. Once these requirements have been met, chlorella will make use of the photosynthetic process to rapidly multiply. For mass production, chlorella is grown outside in artificial concrete ponds. In most algae growing operations, the sunlight only breaks through the first few inches of water. This is due to the growth and development of the algae. As the cells multiply, the population becomes so crowded that rays of sun are blocked and cannot penetrate the water. The cells at the top suffer from overexposure, while those at the bottom receive no light at all. Light is an essential component of photosynthesis, the process by which plants convert sunlight into food. To overcome this problem, chlorella farm ponds include rotating arms. The arms circulate the algae, bringing cells from the bottom to the top, ensuring an even distribution of sunlight. To guarantee high rates of growth in chlorella operations, provide algae with basic nutrients. Algae need nitrogen, phosphorus and potassium for proper cell development and function. 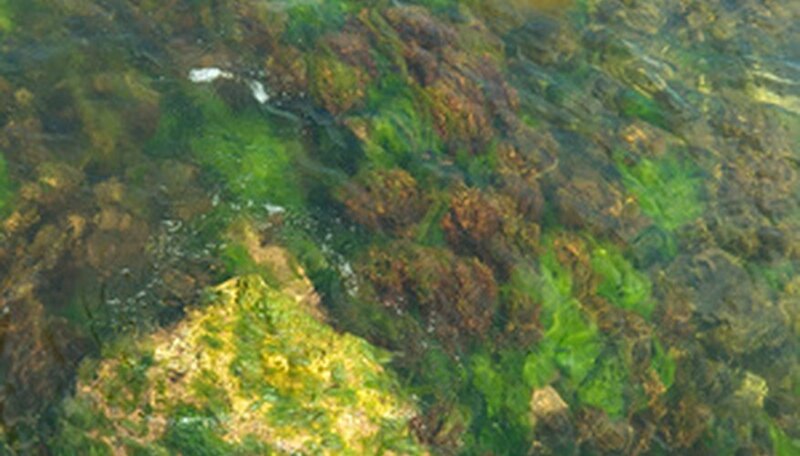 Additionally, iron and silica can be important as the lack of them in aqueous environments can lead to stunted rates of reproduction among algae cells. Since chlorella live in water, care must be taken to make certain the growing environment remains healthy. Farmers begin with fresh, clean, natural water. However, many chlorella ponds are open to the elements. This leaves the water in which the chlorella are trying to grow exposed to possible invasion by other microorganisms or bacterial contamination. While these types of systems are less expensive to construct than their enclosed counterparts, controlling production can become a problem as it is impossible to regulate the growth conditions. One possible solution to this situation would be to surround the pond with transparent plastic. Not only will this protect the water in which the chlorella is growing, it will also allow the farmer to extend the growing season by helping to keep the water warm for longer periods of time. The rotating arms of the chlorella pond also help to incorporate carbon dioxide into the water. Carbon dioxide is released into the atmosphere as a waste product of human respiration. As the arms rotate, they move carbon dioxide from the surface into the water where it readily dissolves. Once it has diffused through the water it is available for use by the chlorella cells. In water, the basic photosynthetic reaction is water + sunlight + carbon dioxide = glucose + oxygen. The glucose is used for fuel while the oxygen is released into the atmosphere as a waste product. Growing chlorella is a seasonal occupation as it requires hot weather and the subsequent warm water it produces. To support the growth of chlorella, the surrounding water should be as close to 82 degrees Fahrenheit as possible as this is the ideal temperature for growth. In temperate regions, chlorella cannot grow in the cool winter months, however it tropical areas of the world it can thrive throughout the year.